GOOGLE EAST. 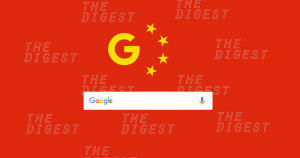 On Wednesday, investigative outlet The Intercept published a report detailing Google’s plans to create a censored search engine for China. A whistleblower provided the site with internal documents on the project, codename Dragonfly, which launched in the spring of 2017. Through Dragonfly, Google is building a special Android search app that follows the Chinese government’s strict censorship guidelines. The government has already seen a version of the app, and the final product could launch in the nation within the next six to nine months, according to The Intercept’s report. A SHIFT IN SENTIMENT. China already keeps a tight rein on the information its citizens can access online. Tens of thousands of “internet monitors” sit at the ready to remove any content the government deems inappropriate. Citizens can’t use unapproved words (such as “disagree”) online, nor can they access Facebook, Instagram, The New York Times — and, yes, Google — that are popular elsewhere in the world. In some cases, homegrown apps that accomplish similar functions have popped up. In March 2010, Google bowed to the pressure back home, granting Chinese users access to an uncensored version of the site. The company cited the Chinese government’s increased attempts to censor web content and limit free speech as one of the reasons for the move. Shortly thereafter, China officially blocked Google, which meant citizens could no longer access the site at all. At the time, this was a solid move for Google, both for its PR and for its finances. But things change, and Google’s decision to return to China confirms that U.S. sentiment on censorship is shifting — maybe restricting access to some information online is OK, after all. FOLLOW THE WORLD LEADER. Indeed, recent events back in the U.S. show that we’re just generally more chill with censorship. Net neutrality is now a thing of the past, clearing the way for corporate control and restriction to certain kinds of content. President Trump has established a national discourse that consistently antagonizes the press and even encourages government censorship of the media. With 750 million internet users, China is a huge untapped market for Google. The move to launch a censored search engine in the nation is likely to be great for both Google’s stock and its shareholders. Google has already proven it’s more comfortable in moral gray areas these days. Now that the U.S. government is less likely to discourage Google from helping a government censor its media, why wouldn’t Google cash in on the opportunity?